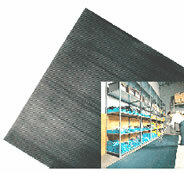 100% PVC vinyl loop mat with vinyl backing is resistant to many solvent, chlorine, inorganic diluted salt solutions, detergents, and salt water. 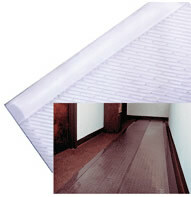 Protection against mildew & ultraviolet lights. NO art charge for camera ready artwork. 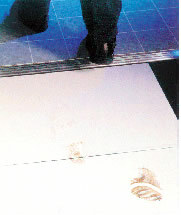 Lead Time 3-4 weeks upon art approval. 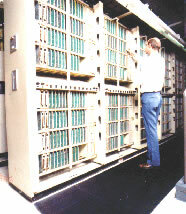 20 colors to select from. Logo may consist of a combination of any colors. 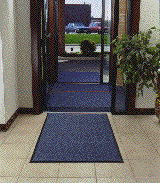 Available in standard 1/8" and wide rib 1/4"
Dura-System carpet mats give your facility a simple system to remove dirt and moisture from foot traffic. 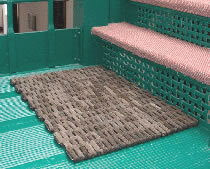 With minimal maintenance, the Dura-System will provide overall protection at your facility's entrance. 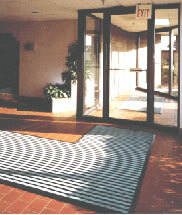 The three carpet mats in the system are used in your facility's outdoor entry points, vestibule and indoor entrances for safety from slips and falls. 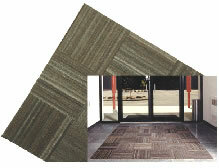 Coordinate Dura-System mat colors to match the decor of your entrance. 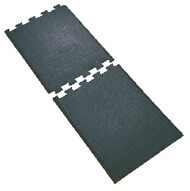 Extremely soft yet tough anti-fatigue mat reduces pain & discomfort caused by prolonged standing. 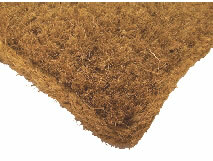 7/8" thick Diamond-Dek Sponge provides extra comfort.